Join the family of FON. With FidoNet on the decline and BBS's almost being a thing of the past, I felt the need for newer ways of sharing my resources with others. I think I now have found a promising one: The FON movement. FON is a community and its members are called foneros. The basic idea is to share access to the InterNet via WiFi. A fonero opens his WiFi access point for other foneros and in return gets free access to the Internet at the access point of all other foneros. World wide. It requires custom software in the wireless router. If you have a Linksys or Buffalo router, you can install the software in your own wireless router. 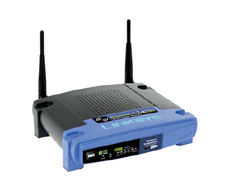 Or you can buy a fon ready router from them for only €5 ... Well, that is ex tax and shipping cost. I payed €17.50 to get it delivered to my door, but that still is a bargain for a Lynksys WRT54GL. The catch is that you must register it within 30 days or they send you a bill for a €45 surcharge, The normal method of registration requires a WiFi capable computer running a web browser. The WiFi environment is completely separated from the local LAN. Visiting Foneros can not see any shared devices on the local LAN. All access is logged and only registered Foneros have access. In addition you can give five members of your family access via your own access point. This article was first published in FidoNews , July, 24th 2006.